The story of an Aboriginal boy whose house is invaded by a Hairyman - a spirit the old people call a Quinkin. When a little green tree frog lands on his windowsill, he knows she has been sent by the ancestors to help him face his fears. Meme McDonald was a writer and photographer who created books for young people and adults. Boori Pryor is from North Queensland. His mother's people are Kunggandji and his father is from the Birra-gubba Nation. Boori is a performer, storyteller and writer. Meme and Boori co-wrote Maybe Tomorrow (Penguin, March 1998) with Margaret Dunkle as consulting editor. The Binna Binna Man (Allen + Unwin 1999) won Book of the Year at the NSW Premier's Literary Awards 2000. Meme and Boori also co-wrote two prize-winning books which have been adapted for theatre. 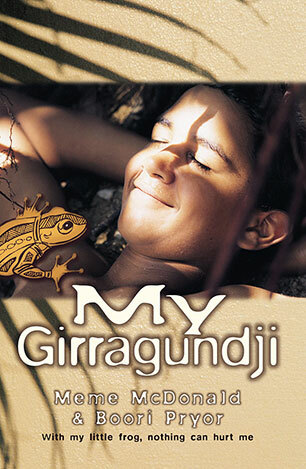 My Girragundji (Allen + Unwin 1998) had two seasons touring nationally with The Bell Shakespeare Company, and Njunjul The Sun (Allen + Unwin 2002) - which received the Victorian Premier's Literary Award for Young Adult Fiction - was adapted by Kooemba Djarra Theatre Company and produced with QPAC in Brisbane. Boori Monty Pryor was Australia's Children's Laureate in 2012 and 2013.